Aberdaugleddaw takes its inspiration from the area crossed by the lines to Milford Haven, Pembroke Dock and Fishguard Harbour. It takes features from each line in an attempt to recreate a terminus at the end of the line from Paddington via Swansea. The start of the last decade of the 20th century was a time for change in west Wales with the loss of direct services to London and radical changes in the parcels and freight areas. Aberdaugeddlaw, although losing its daily HST to London, still retains newspaper and mail trains with an improved Sprinter service to Swansea, Cardiff and beyond. Freight is buoyant with a revitalisation of the dock area to servie the import and export of steel products. 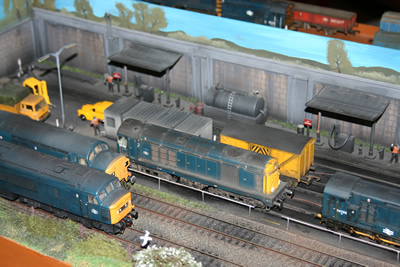 The MoD also has a strong presence with two depots on the Aberdaugeddlaw branch. Although not seen at the terminus itself, oil trains still move huge tonnages from the west Wales refineries and a new flow of coal has begun using a redundant refinery wharf. Locomotives from these workings are seen regularly stabled at Aberdaugeddlaw. Gilbert Junction is a US HO switching layout using Kadee couplers for 'hands-off' operation and Peco US code 83 track. 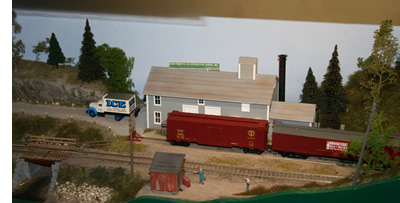 The layout represents the 1950s Bosten and Maine Railroad with passenger, freight and milk trains. 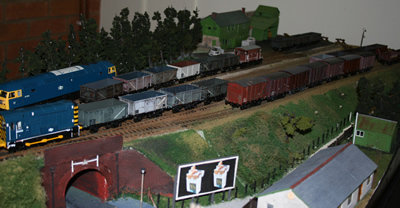 The main industry is a dairy and there is a branch line interchange yard and a track to an off-stage paper mill. Many of the freight cars are resin kits and some of the locos are repainted. Many of the structures are scratch-built. 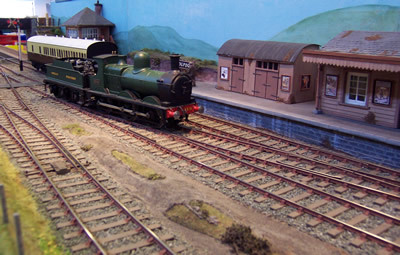 The layout is operated on DC but has been used successfully with a DCC system. 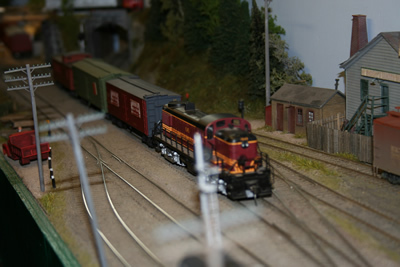 Other US railroads and periods make occasional appearances on the layout. The operators are always happy to discuss the layout, US rail-roading and modelling and - occasionally - DCC operation. 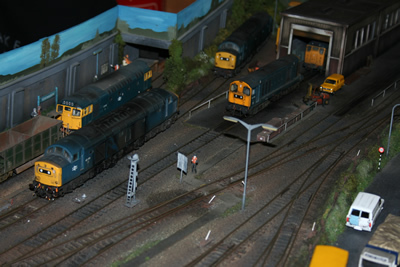 Kirkbridge is a small traction motive depot (TMD) set in the Glasgow suburbs. 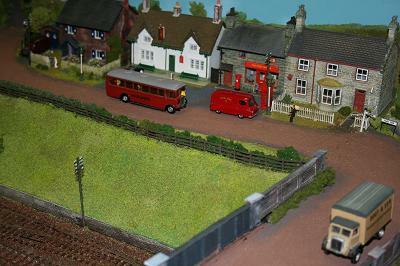 The TMD has a small halt station which sees a local DMU service and parcel trains. It is set in the mid-seventies when British Rail blue livery rules the rails. There is a a range of locomotive classes: 06 and 08 shunters, plus many main line class 20, 24, 25, 26, 27, 31, 37, 40, 47 and class 55 Deltics. 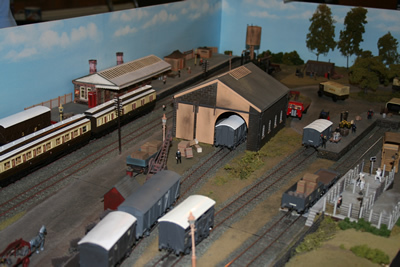 The layout also has a small depot shed with two fuel points, and carries out repairs to carriages and wagons. This was the first exhibition for Limesbridge. 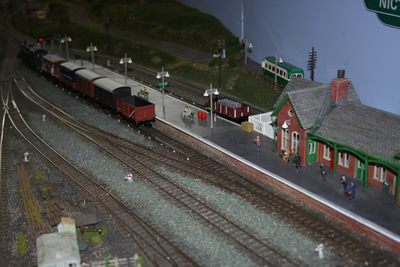 The layout is intended to depict the atmosphere that was around a GWR station during the 1930s. 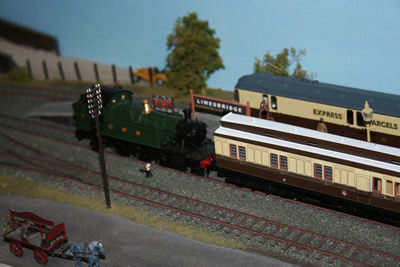 Being fictitious, it allows the use of modellers' licence in creating something that depicts a rural location. The station forms a junction where passenger trains arrive from the main line to connect with trains for the local branch. Freight trains can either terminate or pick up/drop off wagons and then make their way up the branch. This layout was built with exhibiting in mind so the baseboards are of an easily manageable size and it can be erected/dismantled quickly and safely. 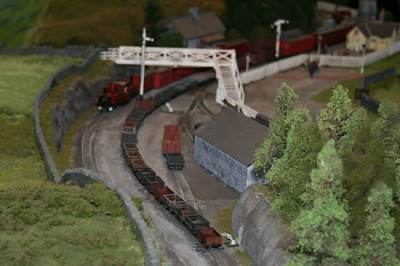 The size of the layout with a large fiddle yard allows us to run longer trains using a variety of rolling stock. Track work is SMP with hand built pointwork operated with Peco motors. 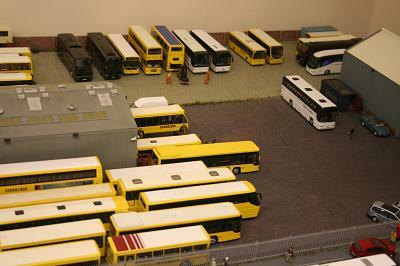 The buildings are mainly from card or plastic kits either as designed or modified to suit. Rolling stock is a mixture of proprietary and kit built, all vehicles would have been seen on the GWR in the 1930s even if they never reached a small station like this. 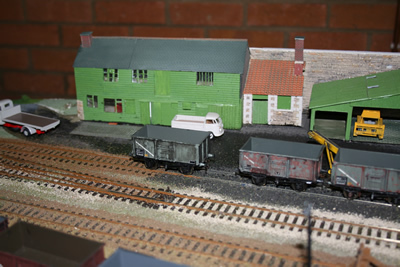 Mortimore's Yard is a small fan of sidings where trains are assembled and split as their wagons make their way from and to customers' sidings in the nearby docks area. 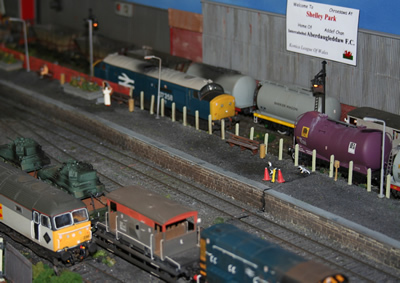 Set on an embankment, closely surrounded by a mix of housing and industry, the Yard represents a typical minor railway installation that operated for over 100 years, virtually unnoticed. But traffic is declining, things are becoming run-down and neglected. Will Mortimore's Yard last much longer than the Western Region's distinctive diesel hydraulic locomotives, themselves under a sentence of death? Although a fictional location, inspiration has come from many real places. The firm from which the layout takes its name ran a coal merchant's business based in Chippenham station yard for many years. Their former offices still stand as a listed building and are modelled. 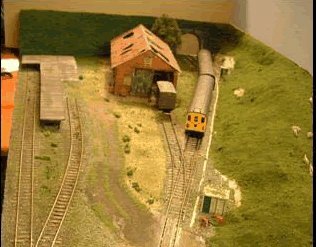 Similarly, other buildings on the layout are modelled on structures in the Chippenham area, some of which are now but a memory. 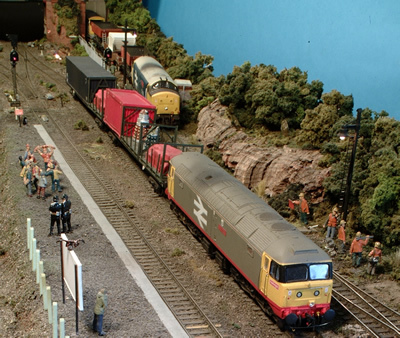 The layout features Digital Command Control using a Lenz 90 unit, and a mix of RtR and kit built rolling stock, with some major conversions and scratch built stock planned. Nictun Borrud is set somewhere in the rolling chalk downland of the Hampshire Downs. It represents the terminus of a small branch line with some freight facility and is set in the late steam / early diesel period. 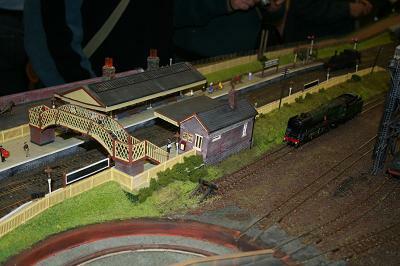 The layout is built to finescale OO standards and features Southern Region. The layout is intended as a fairly close representation of what might have existed at Southwick if the US Army Transportation Corps had had their way and built a branch line to allow the Allied Heads of Government and Defence Chiefs meeting to take place at the SHAPE headquarters in HMS Dryad. In the event, the meeting took place aboard the LMS Royal Train which was parked in the goods yard at Droxford for the duration. It is likely that this line would have left the Mean Valley line just south of Soberton village. But if it represents Southwick, why is it called Nictun Borrud? Well, as the original board was scavanged, the crew decided to continue this way of working and almost everything on the layout has been either 'nicked' or 'borrowed' from other projects or members' bit boxes. Hence the name, Nictun Borrud. Tan-y-Bwlch is an important passing place about halfway along the mainly single track Festioniog Railway. Its loop allowed long slate trains, running down to Portmadoc under gravity alone, to pass equally long loco-hauled mixed trains taking passengers and empty slate wagons up to Blaenau Ffestioniog. 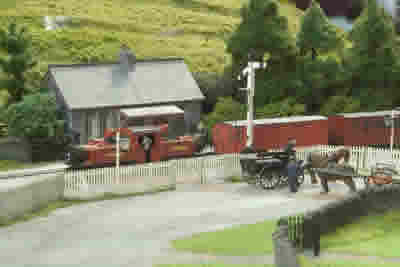 The layout attempts to portray Tan-y-Bwlch station in the early 1900s before the station building was extended to make a dwelling house for the station master and the aim is to show one full day's running on the Festiniog Railway at that time. There are quarrymen's trains, gravity slate trains, passenger trains and mixed trains passing through and crossing. The buildings, trees and walls are scratch-built. The track, except for one point, is Peco. 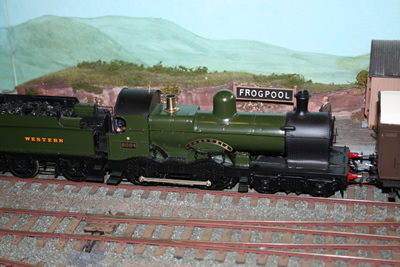 The stock is a mixture of kits and scratch building and illustrates attempts to model Festiniog vehicles over a span of some 40 years. Some vehicles are real 'heritage' items!